Nairobi — Traffic snarl-ups were witnessed at filling stations across Nairobi on Wednesday as outlets stopped restocking petroleum products over speculation on the signing into law of the Finance Bill (2018) which seeks to further suspend a 16 per cent Value Added Tax (VAT) for two years. President Uhuru Kenyatta has 21 days since adoption of the Bill by the National Assembly to assent the law or return the Bill to the House with a memorandum outlining possible changes. Kiprono Sang, a Customer Service Attendant at a Shell station along Kenyatta Avenue told Capital FM News fuel shortage was looming with the filling station having run out of petrol by midday. "The reason you can see this queue is that we're actually running out of fuel. Diesel is currently selling at Sh115 from Sh102; petrol has risen to Sh127 from Sh113. In the next two hours we'll only be selling diesel which again could run out by the end of the day," Sang said. Atieno Okudo who had queued at the fuel station waiting to refuel her car expressed concern over the looming crisis saying the tax charge on petroleum products was ill-timed. According to Okudo, fuel dealers could also be hoarding the product in order to take advantage of desperate motorists. "I'm concerned that I have to queue for so long because I am late for a meeting. The trouble about this country is that people always want to cash in on some of these situations," she said. 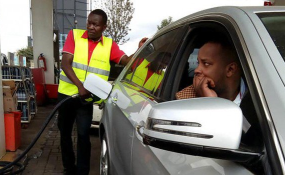 Enoch Wambua, a Public Service Vehicle driver who had also queued for fuel told Capital FM News getting the product had become increasingly difficult. "The fuel stations are telling us they cannot restock before they know whether the current VAT will be scrapped or not. I have been looking for this product since morning and as you can see, I have to queue before I get petrol here," Wambua lamented. The 16 per cent VAT on petroleum products became effective on Saturday. In a last-minute dash, the National Assembly last Thursday passed the Finance Bill (2018) which seeks to defer the implementation of the VAT on fuel contained in the Finance Act (2013). The Act had deferred the VAT for three years after which the National Assembly in 2016 voted for another postponement of the tax charge for a period of two year ending August 31, 2018. Consequently, the 16 per cent VAT on petroleum products took effect on September 1. According to National Assembly Majority Leader Aden Duale, the fuel tax charge on petroleum products will remain operational until the Finance Act (2013) is suspended further in line with a resolution passed by the House on Tuesday last week when the Finance Bill (2018) was adopted. "President Kenyatta can sign the Bill so that the VAT is suspended until 2020. Alternatively, he can still disagree with the National Assembly and say the government needs resources to fund its programme," Duale said at the weekend. The tax has affected bus fares with some PSV routes charging 25 to 50 per cent above the normal rate. PSVs operating in estates on Mombasa Road, for instance, increased their fares from Sh80 to Sh100 during peak hours with those operating the South 'B' route raising fares by Sh10. Commuters from Rongai will have to contend with a Sh50 addition to bus fares which will see them pay Sh150 during peak hours. In a statement on Saturday, the Kenya Revenue Authority (KRA) confirmed the application of the 16 per cent VAT saying the period for which the Finance Act (2013) had been suspended had lapsed. "The changes are contained in the Finance Act 2013 which extended the exemption for three (3) years. Further, the exemption was extended by two more years under the Finance Act 2016. Consequently, the VAT charge on petroleum products has now come into effect," Commissioner General John Njiraini said in a news release. Njiraini directed fuel dealers to submit VAT returns to KRA by October 20.